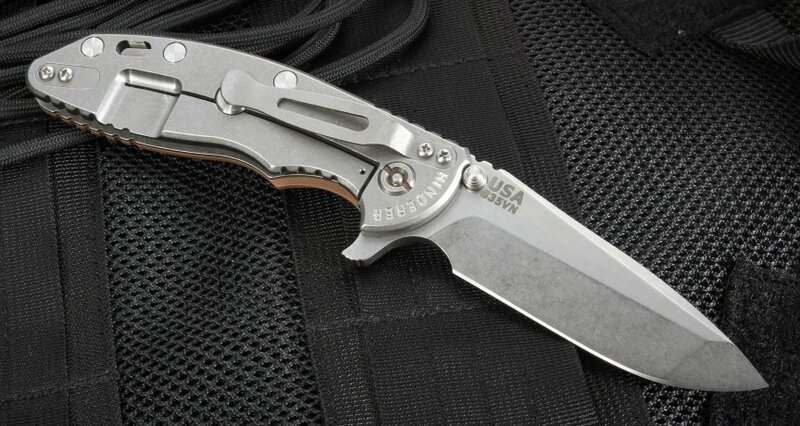 Take on any natural or man-made challenge with this strong tactical folder from legendary knifemaker Rick Hinderer. XM-18 folding knives are known as some of the best-designed and best-built tactical tools in the world, and the Hinderer XM-18 3.5" Spanto flipper with textured tan G-10 lives up to the high quality standards and demands of users. Hinderer Knives are made in the U.S. with the latest CAD and CNC precision technology for a smooth operating and attractive looking knife. 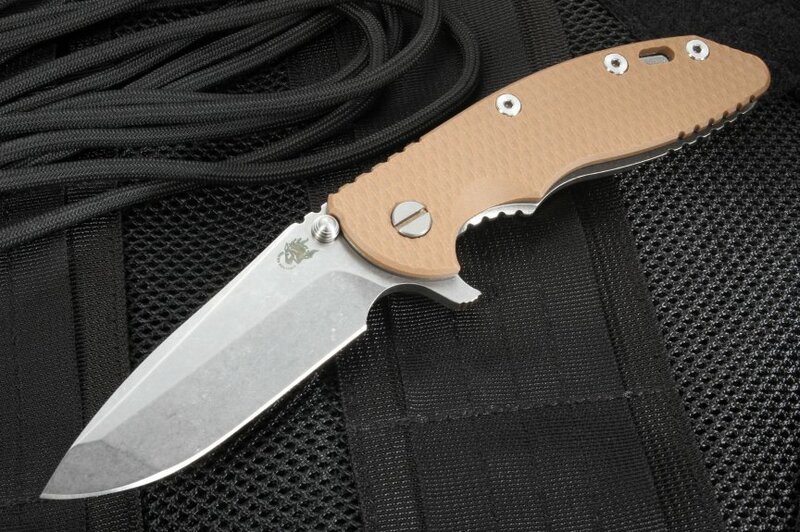 The Hinderer XM-18 Tan Flipper has a 3.5-inch stonewashed blade forged from American-made stainless CPM S35VN steel from Crucible Industries with a fine stonewash finish. The wear- and corrosion-resistant steel has an RHC 60-61 rating, which holds a sharp edge without being prone to chipping or cracking. The hybrid Spanto blade is one of the most popular in the XM-18 series, combining the slicing ability of the Tanto and the thrusting accuracy of the spearpoint. An integral flipper as well as dual thumb studs make opening this Hinderer XM-18 quick and easy with either hand. The handle of the XM-18 Spanto 3.5" is made of aerospace grade titanium with a stonewash finish and has a textured tan G-10 handle scale on the non-locking side, giving users superior grip and comfort in all weather. Additional traction is provide by the jimping on the thumb rest and handle spine. 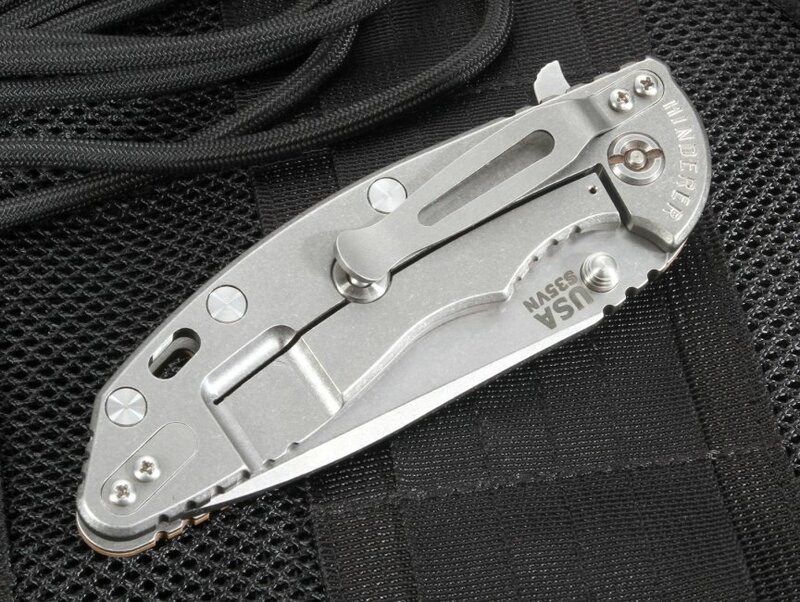 The strong tumbled frame lock has a Hinderer lock bar stabilizer to prevent overextending the lock. Carry your XM-18 Tan Spanto tip-up or tip-down with the reversible titanium pocket clip or use the rear lanyard hole and your favorite lanyard. At 5.4 ounces, this knife is light and controllable for times you need a precise cut. This heavy-use tactical flipper has earned the prestige of being one of the best all-purpose knives in its class. EMTs, Special Ops, outdoorsmen and others will love the Hinderer XM-18 3.5" Spanto that's backed by a limited lifetime warranty. Get your fine knife quickly and easily with KnifeArt's same-day order fulfillment and free shipping.